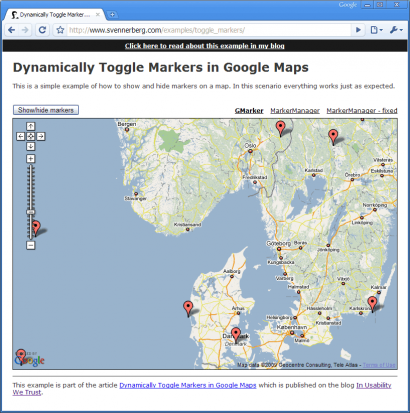 The MarkerManager is a very useful Open Source Utility Library for Google Maps with the sole purpose to manage larger amounts of Markers. If you add markers with the MarkerManager you can control at which zoom-levels they will appear. And you can also hide and show them dynamically. If you want to learn more about the MarkerManager and other libraries out there that deals with markers, read my article Handling Large Amounts of Markers in Google Maps. Now the most effective way to add markers to the MarkerManager is to first add them to an array that you then add to the MarkerManager with the addMarkers() method. The code to do this would be something like this. Obviously it’s kind of useless to add only one marker this way. It would only be useful if you had at least a few of them, but I think you get the point. In the Google Maps API there are two handy methods to toggle the visibility of markers. These are GMarker.show() and GMarker.hide(). They both work as expected, you call hide() and the markers disappears and then you call show() and the marker is displayed again. There is however one caveat and that is when you zoom the map the markers will magically appear again. This is an annoying bug that only appears when you use it on markers added with an utility library. So far I've only found one solution for this and that is to extend the hide method and tweak the code to place the marker outside the map, thereby making it sort of invisible. Subsequently you need to prototype the show method as well so that it moves the marker into the correct position again. It's a dirty solution I know, but so far it's the best solution I've found and it works really well. Note: I haven't come up with this solution myself but haven't been able to find where I saw it. So if you know who did come up with it, please tell me so I can give credit where credit is due. The Google Maps API also offers a method to determain if a marker is hidden or not, GMarker.isHidden(). If you want to be able to use that you have to prototype it as well. I've put together a few examples of different scenarios using this, so that you will see the problem as well as the solution to it. There are several other libraries for dealing with markers out there, and in at least one of them, Clusterer, I've noticed the same bug as in MarkerManager. The fix proposed in this article will work just fine on that one as well and possibly on other libraries where you might also find this bug. If you've encountered this problem in other libraries please let me know. It would also be interesting to see other, and possibly more elegant solutions to this problem. Thank you for sharing that. The same problem occurs with MarkerClusterer by Xiaoxi Wu. Ok, I suspected that it would occur in other libraries as well. Thanks for letting me know! Thank you so much! I was getting pretty frustrated before stumbeling on your solution. Works just perfect. I have found an easy solution for this issue and hope it may help. I also tested thoroughly. The fix is given below. NOTE: I have pasted below the complete code for viewing a sample example implemented with the fix for markermanager utitlity bug. I would like to read your article, but I can not open the page, you’ve linked. Could you please send it to kolis29@gmail.com. Great script! Extremely useful thanks so much for posting! Is it possible however to have certain items in the legend checked and appear on default, and others that do not appear on default and must be clicked in order to be displayed? Help in this would really be a lifesaver! Nice article, but I have an other method. Might be ‘hacky’ but it works fine. Only requirement is to have the google map object stored in a variable. I haven’t found any bugs with this. Are there other reasons for not using this method? That’s not at all a hacky way to do it but in fact exactly how you should do it with version 3 of the Google Maps API. This article however, describes how to do it in version 2 of the Google Maps API. Google redesigned the entire API with a totally new syntax in version 3.